RJC Yacht Sales Sell a 2004 80' Hatteras Enclosed Bridge MY! Congratulations to Raymond Young of RJC Yacht Sales with the sale and closing on a 2004 80' Hatteras Motoryacht to his clients which are new to yachting! 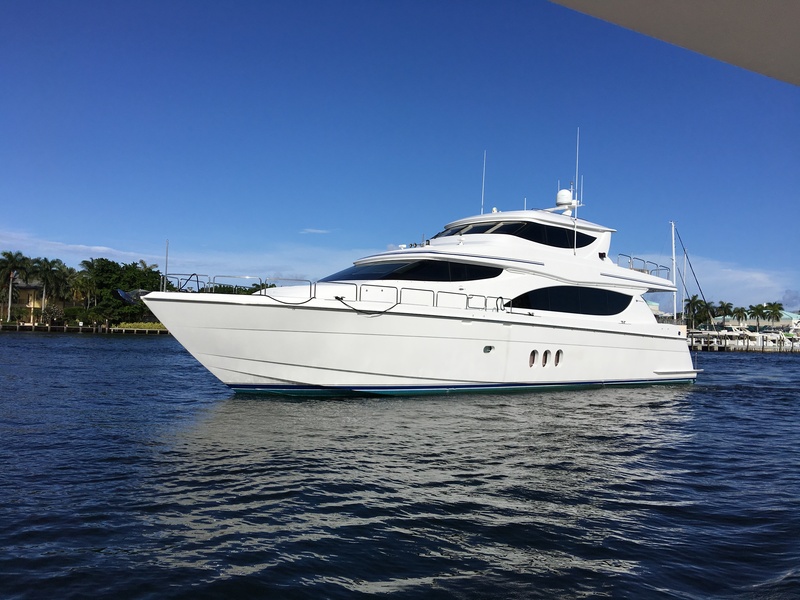 The Hatteras was delivered in 2004 as an Enclosed Flybridge model and was refitted in 2014 with a new interior by Shelley Interiors Design. This interior features high gloss African mahogany joinery, granite counter tops, custom furnishings, designer fabrics and rich leathers. She accommodates eight guests in four cabins consisting of a King master, two Queen staterooms along with a twin cabin, all with ensuite heads. The large aft deck is designed for al fresco dining with a curved settee, dining table, chairs and a full wet bar. The main salon features a sunken bar, leather sofa and club chairs plus a full entertainment system with a 46" Samsung flatscreen TV. The Hatteras 80 was asking $2,239,000. Her new name is VICKIE B and will be based out of Palm Beach, FL.